I find myself in leggings more often than not these days, as winter finally starts to loosen its chilly grip on my wardrobe. These gray leopard leggings are from a few years back, but they still make the cut pretty often since their soft color palette makes them somewhat neutral. Ok, so maybe you don't consider leopard print a neutral, but in my world that's just par for the course. 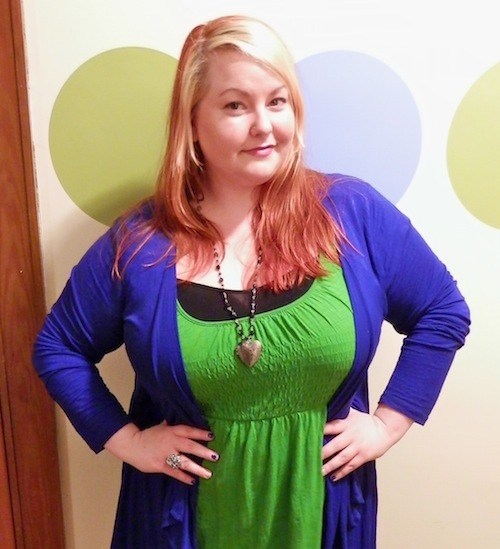 Paired with super bright pops of color like my beloved cobalt blue and green (which I love with my newly dyed red hair! ), these leggings make a statement while still letting the color be the star in this outfit. Basically, bright colors + leopard = Michelle. Wearing this locket makes me feel like an edgy school girl with its rosary-like chain. Target clearance! This ring is so colorful and magnificent in person (but reallllly hard to photograph) and I found it just laying by the jewelry supplies at Michael's - you really never know where good accessories will pop up!